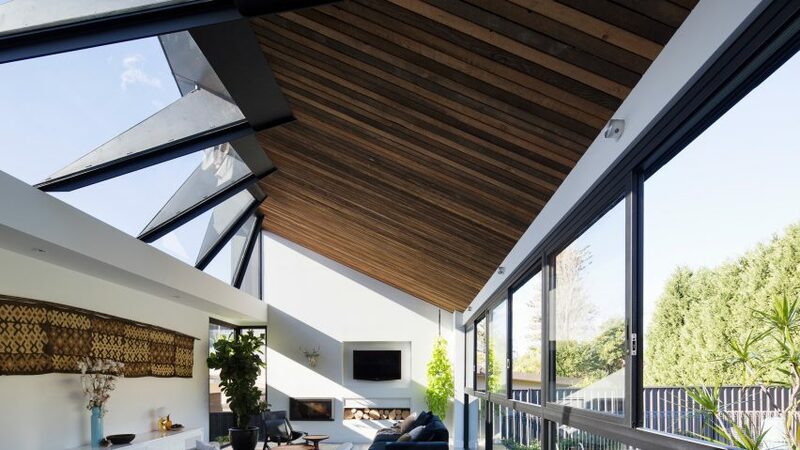 Stepped skylights twist up to a peak at one side of this extension designed by Nick Bell Design for the rear of a Sydney residence. Local architects Nick Bell Design wanted to create a light and airy kitchen, living and dining room for the property named Rosebridge, which is located on a south-facing plot in the city's North Shore suburb. 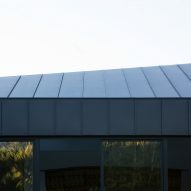 The large roof window that lights the extension from its southern side features rib-like steel frames that cradle the windows as they stagger from flat to vertical angles. "The roof form transforms from a near-flat skylight through a progression of steel angles to end as a vertical window," said the architects. "These angles provide a sculptural form that transform shadow and light into the main living spaces as the days progresses." The angle of the black steel roof follows the windows, gradually changing from flat to a peak at the corner. Black-painted wood clads sections of wall between the glazing below. "Externally the roof window creates an asymmetric form that was wrapped in black steel and timber cladding in contrast to the lightness inside," explained the architects. The northern side of the extension features floor-to-ceiling windows, with sliding doors that open to a yard containing a swimming pool. Inside, the slanted ceiling is lined with light-coloured timber panels, intended to warm and soften light reflected by the polished concrete floor. The kitchen on one side of the space features white cabinets and the walls are painted white throughout. 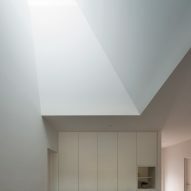 New skylights with deep angled reveals were inserted into the roof of the front of the existing property, which has been otherwise left unaltered. Other extensions to single-storey residences in Sydney include a dark-toned addition to white Federation house by Studioplusthree and a slatted sun-shading screen Bijl Architecture added to a refurbished bungalow. Photography is by Simon Whitbread.